Jean Dubuffet: Imagining the Inner Landscape of the Mind | Skinner Inc.
What does the inside of an artist’s mind look like? Purportedly inspired by a doodle he made while on the telephone in 1962, the French artist Jean Dubuffet (1901-1985) sought to reveal the inner landscape of the mind by creating a new type of art he called Hourloupe. He would fill entire pages, or canvases, with fluid scribble-like lines in densely packed, all-over compositions, like this work entitled Situation LXXXXI (a l’arbre) (Lot 425) coming up in Skinner’s Fine Paintings & Sculpture auction on September 23. Dubuffet explained that these forms evoked the manner in which objects appear in the mind. Indeed, the name Hourloupe implies a magnification of the conscious, or unconscious, mind-scape, distorted by normal temporal dimensions. Disparate figures and forms appear in close association with one another, compressed as if co-existing in a temporally altered reality. The visible result is a crowded jumble of images and emotions. The very same year Dubuffet invented Hourloupe, he was photographed by the British artist Bill Brandt. In the picture, Dubuffet looks back at the viewer with an inquisitive gaze. His upper body is visible, situated in a desolate, rocky landscape. An expanse of macadam, interspersed with a few shreds of grass, extends beyond his shoulders towards the horizon. 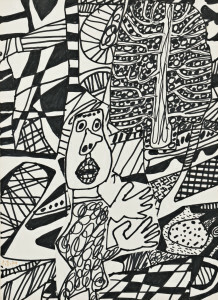 Dubuffet appears alone, with only dark fleck – possibly a tree – in the distance. A scarf is neatly tucked into his warm, wool jacket and his hat leaves the top potion of his eyes mysteriously in shadow. Might Dubuffet’s ink drawing, Situation LXXXXI (a l’arbre), provide us with a glimpse into what lies behind the other side of Dubuffet’s gaze in Brandt’s photograph? Similarly situated in the lower center, a cartoonish figure with wide eyes, big nose, and gaping mouth seems to be wandering in a thickly-filled, disorienting space. His hands are open and outstretched, perhaps seeking to grasp what he is looking for. Upon close inspection, there are striking similarities between this ink drawing and the photograph: in both there is a figure in the lower center left and just above, to the right, there is a tree. Moreover, the wandering man’s facial features are uncannily like Dubuffet’s. Could the wandering man actually be a self-portrait that provides us with insights into the artist’s imagination? Of course, there is another artist here: British photographer Bill Brandt (1904-1983), who looked through the camera and captured Dubuffet’s likeness. Throughout his career, Brandt, in addition to photographing high and low society subjects, street scenes, and abstracted nudes, also took snapshots of modern artists such as Georges Braque, Reg Butler, Salvador Dali, and Henry Moore. He attempted to portray aspects of the artist’s work through the portraits, and in this case, Brandt probably chose this specific gravel setting to recall the thick, material impasto of Dubuffet’s 1950s paintings. 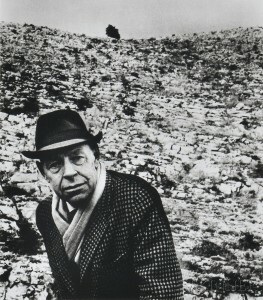 In this photograph of Dubuffet, therefore, we not only see the artist Dubuffet, but also how Brandt perceived and interpreted the artwork made by Dubuffet. In effect, we can peek into Bill Brandt’s mind through Dubuffet’s. While we do not know how close these two artists’ friendship was, we can certainly see from these two works that there was an incredible mutual admiration. This entry was posted in Blog and tagged art auction, Bill Brandt, boston, Boston art auction, drawing, Dubuffet, european art, fine art, Hourloupe, imagination, Jean Dubuffet, modern art, paintings, photographs, prints, sculpture, skinner, skinner auctions by Martina Tanga. Bookmark the permalink. ← Who Can Come to an Auction?